Pimple is nothing but a spot caused due to excess of oil in the skin leading to the inflammation of skin with the formation of pus inside it. Nowadays It is a common problem in the life of teenagers. It can be treated in many ways by discovering the root cause. 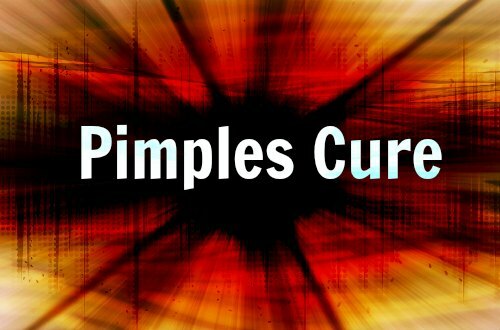 Pimples are caused due to many factors like hormonal imbalance, excess oil in the skin, dandruff, improper usage of fairness and sunscreen lotions, medications etc… Despite the causes, there are many simple ways to get rid of pimples which are as follows,..
Turmeric powder is an antibiotic which helps to fight against the pimple causing microbes in the skin. One can use turmeric as a face mask and leave it for 15-20 minutes in the skin and wash it off. If you tend to have any irritation, you can rinse your face with cold water. Similar to turmeric powder, lemon juice will also act as an germicide to defeat microbes in the skin. It also helps to balance the excess oil in the organ. Lemon juice is highly advisable to the oily skin. Mix cinnamon powder and lemon juice extract. Apply the mixture in the face and leave it for 15-20 minutes and rinse it off.One can use lemon juice to get rid of pimples quickly. Cucumber is a best remedy for the skin inflammation. It acts as a coolant in the skin and thus reduces redness caused due to pimples.You can mince the cucumber and apply it directly on the affected area. Leave it for 20 minutes and rinse it off. Do this twice a day to get best results. As we all know, Honey is a natural skin purifier, it helps to clear the skin from bacteria and dirt. One can use honey on the pimple spot which helps to reduce the inflammation of the skin rapidly. Steaming helps to open the skin pores and allow the skin to breathe. It is very effective for all skin types.It helps to get rid of dead cells,excess oil and dirt in skin. One can steam twice a week for healthy, glowing and clear skin. Papaya is a wholesome natural product that consists of numerous health benefits. It is particularly very good for skin. It helps in cleansing, smoothing and brightening the skin. One can crush the papaya,apply it on the face and leave it for 15-20 mins. Wash it off to get a healthy and natural clear skin. In today’s polluted environment , we should keep our skin cleansed regularly. Whenever we are exposed to sun, dirt and sweat make sure that you wash your skin and keep it clean. When the dirt and sweat remains uncleaned on skin surface, it can cause acne. So cleansing your skin twice / thrice a day is very much important to have a clear skin. One can use ice cubes on the acne spot to diminish swelling and urge the oil organs to contract and release the abundance oil and microbes from the skin surface. This tip may sound weird but it has been evident that toothpaste is an amazing acne treatment. One can apply the white toothpaste on the pimple spot in night and rinse it off the next morning for best results. Use white toothpaste instead of gel. Baking soda is one of the powerful home remedy for acne treatment. It has numerous benefits over skin. It can be used as antiperspirant which helps to reduce the inflammation and redness caused by pimple overnight. One can use mixture of baking soda and lime juice in the affected area leaving it for 20 minutes and rinse it off with cold water. For best results, use it twice a day. Other than natural home remedies, there are some more treatments suggested by the dermatologists. They are as follows. Crushed Aspirin helps to remove excess oil, dry out the acne lesion, reduces the redness and swelling caused due to the pimple. It is highly recommended by the dermatologist to clear pimple over night. Tea Tree is mostly used for treating skin break out and pimples. It helps to kill the microbes in the affected area. Thus the results are quicker. One can use tea tree oil directly to the affected area or else it can be mixed with the equal amount of aloe vera gel. Leave the mix in the skin for 20 mins and wash your face. Do it twice a day to clear the acne rapidly. It is the most common method for treating acne with proper pH levels. It helps to kill the microbes and dry up the excess oil in the skin. You can use this on the pimple spot and leave it till it becomes dry. To get effective result,use it regularly. It is one of the most acne defeating treatment. It acts similar to the salicylic acid. It helps to remove dirt and excess oil in the skin surface, reduces the irritation and redness in the skin. Apply it on the spot one / twice a day ,till the pimple gets reduced. Clay mask is the easiest and affordable treatment for acne. It helps to draw out the impurities, balance the oil content on the skin. It can be used as a spot treatment for best results. Use it regularly as a face mask to prevent getting acne in future. Cortisone Injections helps to treat painful acne. It treats the acne rapidly and the results are amazing. This treatment can be done only with the help of dermatologists. Hence the results are undoubtedly fantastic. Jessner peels are most effective acne peeling treatment which helps to remove the acne overnight. They help to remove the top layer of the skin which in turn remove the excess oil content in the skin surface. These peels should be handled by the experienced dermatologists only. Retinol is nothing but a type of Vitamin A complex which is used to remove drying acne spots. It can be strong for sensitive skin type. It should be used with the proper prescription from the dermatologists. One can apply it on the affected spots once/twice a day to get better results. By following the above beauty tips, If you come across any irritation or side effects, please stop the treatment and consult a dermatologist.